Fantastic Small Gas Generators | Which Model is Best? You are here: Home / small gas generator / Fantastic Small Gas Generators | Which Model is Best? I feel that every homeowner should have at the very least, a small gas generator in their garage just in case they need it. I consider a small gas generator an essential ‘tool’ to have around the home, especially for emergency situations. You never know when the power will go out at 3am and you find you and your family are stuck in the middle of night. If you’ve ever had this happen then you know the frustration that washes over you in that moment. “Oh, what about all of the food in the refrigerator? How long before the food spoils?” Either way, we’ll cover a lot of topics related to portable gas generators and which models is best for your particular needs. We hope you find this generator guide useful and informative. NOTE : If you don’t want to read technical information related to gas generators then I recommend skipping to the section on the small gas generator reviews. We’ve come a long way ever since we learned how to harness the rampant properties of what we currently know as electricity. Nowadays, we have unlimited access to the main grids, virtually everywhere we go. However, as extraordinary as that may sound, our technological advancements have given us something even more remarkable, and our case for deep focus in this article – generation of electrical energy. Whether camping under the stars with family and friends and we need to use some of our appliances, or in the case of a faulty power supply at home and we require a complementary energy source for the most urgent tasks, these small devices will do the trick – portable generators. But before we dive into this subject matter, here’s a quick overview of what we’ll be covering. First of all, we’ll kick it off with a bit of history, along with some key concepts and definitions, which will all come in handy as we dissect the technical specs and unique features of some of the most popular portable generators available in the market. After we’ve got that covered, we’ll talk about the operating fundamentals which make these small generators work — this is important because it’ll begin paving our understanding of which type of device will best suit our needs. Then, we’ll get our hands dirty with a practical sizing exercise which will teach us two highly relevant notions – how to calculate our power demand, and how to calculate our generator size. As we wrap it up, we’ll address some common features found in most commercial generators and how to set them up-and-running. And last, but not least, we’ll thoroughly analyze a list of small gas generators models. We’ll talk about their designs, specs, ideal purposes, pros and cons, comparisons among them, and much more. Our primary goal is to provide you with absolutely all of the information you need to make an insightful, objective, smart, and fact-based buying decision. How Big of A Generator Do You Need? Briggs and Stratton makes a wide range of quality portable generators. A Little History, Concepts, and Definitions. Portable generators as we know them today first came into light as a somewhat different construction, almost 200 years ago. You might have heard of Michael Faraday – the father of electromagnetism and arguably the one to praise for the practical applications of electricity, which was until then, an unexplored phenomenon. During his experiments with magnetism in 1831, he built the Faraday disk – a device which consisted of a rotating copper disk placed between the poles of a horseshoe-like magnet. His invention was capable of generating a small DC (direct current) voltage. It was never put to any practical application because it was highly inefficient. However, this little disk proved that it was possible to generate an electric power source by using magnetic properties. This discovery led to the first DC dynamos and AC (alternating current) alternators – both of which are considered as the mechanical foundations of electric generators. Dynamos and alternators are both types of electromagnetic generators. A dynamo makes use of a commutator – a mechanical moving device which reverses the direction of the current between the rotor and the external circuit, periodically – to generate a DC power source. Smaller dynamos employed one or several permanent magnets to generate the magnetic fields, while the larger ones adopted electromagnets – also known as field coils, which could be excited separately. Historically, these generators were widely used in electric power stations as well as in the first motor vehicles – for battery recharging. Today, dynamos are still used where a low-voltage DC is needed, such as on mobile phones rechargers, hand-powered flashlights, and clockwork radios. Once considered as the staple in industrial power generation for the larger part of the 19th century, they have since been replaced by AC alternators. DuroMax XP4400E : Never use a gas generator indoors. Alternators hold a much more interesting concept for our case study, and that’s because all fuel-dependent portable generators rely on it. They generate an AC power source by converting mechanical energy into electrical energy, and they too, depend on magnetic fields to do so. A small note on the side, steam-driven alternators found in power plants – also known as turbo-alternators – are responsible for generating most of the world’s electrical supply. These generators have a simple working system. They are typically composed of two parts – a rotating part comprised of a magnet with opposite polarities called the rotor, and a stationary part built from conductors coiled on an iron core called the stator. As the rotor spins within the boundaries of the stator, it generates an EMF (electromotive force), and because this EMF reverses its polarity when moving under opposite magnetic poles, the electrical energy created comes in the form of AC voltage. Same as dynamos, alternators generate their magnetic fields by using either permanent magnets or independently excited field coils. Ever since the 1960s, AC alternators have replaced DC dynamos. They’re now the standard in power plants and automobile engines. Now that we’ve covered all about electric generators – history, classification, working mechanism, mechanical construction, power output, historical applications and modern-day impact – it’s time we dive a little deeper into the makings of small gas generators. Simply put, a portable generator is a generator large enough to support a fuel-based engine attached to an electrical generator, yet small enough to be easily transported. Quieter than a traditional camping generator. Clean power. While it’s technically possible to find (or build) a small gas generator with a dynamo-based engine, virtually all portable generators available today make use of alternators. Regardless of size, these generators can run on a variety of different fuels, such as natural gas, diesel, methane, propane, and other petrol derivatives. Typically, though, small portable generators run on gasoline, and we’ll focus on them exclusively. Additionally, we’ll discuss phases (single-phase and three-phase), voltage (typically ranging from 110V-240V), frequency (either 50Hz or 60Hz), and power (expressed in watts). Understanding all these variables is crucial for knowing your exact power demand, and for accurately sizing the generator that will satisfy that load. There are two main factors which will determine your phase, voltage, and frequency – your geographical location and your power supply categorization. However, we’ll only consider residential areas – because both commercial and industrial districts usually require larger, stationary, diesel-fueled generators. For example, in the United States, almost all residential and rural areas run on a single-phase, 120V, 60Hz, AC power supply – with the possibility of encountering a split-phase installation, which allows higher power loads. Most of the European countries also run on a single-phase, but with a 230V, 50Hz, AC power supply. The type of phase you have installed is relevant for one VERY IMPORTANT reason. You can power a monophase connection from a polyphase system, but NEVER the other way around. Which is why close to all portable gas-fueled generators sold in the United States have a monophase circuit. In a few European countries and most of Latin America, you will find that most residential areas have a polyphase circuit installed, so it’s much more likely to find three-phase portable generators in those countries. Additionally, due to the massive availability of power transformers, the variation in voltage is no longer an issue – these devices are capable of transforming the electric current into a range of different output voltages. As for the frequency, we only have two choices – 50Hz and 60Hz. Common sense might tell you that a 60Hz frequency is better because it’s higher in value. That’s not necessarily true, though. Remember earlier when we talked about alternators and their mechanical design? The way they generate an alternating current? Well, every time the rotor completes one full spin, that’s one cycle. Big powerful dual-fuel generator uses gas and propane. Frequency is the number of cycles which the AC completes in one second. Because portable generators create an AC power output, the frequency in Hertz will determine the total number of rpm (revolutions per minute) in the engine – here’s a practical example which will help you understand how portable generators work, and engines in general, too. Keep this formula in mind: N=120f/P, where N is the number of rpm, f is the frequency, and P is the number of poles in the engine. A 2-pole generator running on a 60Hz power grid – such as in the U.S. – will rotate at 3,600rpm. Four-pole motors will do it at 1,800rpm, and so on. The higher the rpm, the faster it will perform light-duty tasks. The lower the rpm, the stronger the machine will be for heavy-duty jobs. Small gas generators are usually considered light-duty devices, so they will normally have two-pole engines. However, ask your vendor about it next time you consider buying a portable generator – as the number of poles will largely determine the kind of tasks it will perform best. Now to the most important player, power. All of our domestic appliances have a particular power demand, expressed in watts. The average electric energy consumption for those appliances is what we know as watts per hour. But what does electric power mean and what does it have to do with generators? Simply put, power equals to the ability to do work. The exact amount of work a device can deliver corresponds to the electrical current passing through an electric potential difference – known as voltage. DC circuits have a uniform and constant voltage value at all times – so we can calculate power in just one step. AC circuits have a catch, though – well, technically two. First of all, these circuits contain both inductors and capacitors capable of storing energy. And the voltage is constantly varying. These characteristics will end up giving us three different power values. CARB Compliant. Professional build quality and ultra-quiet. Reactive power is the amount of energy in storage within the circuit – irrelevant to our case. Apparent power is the theoretical number obtained when multiplying the values of both the electric current and the voltage at any given moment – close, but not quite. The most accurate measure comes with real power, which is the value of apparent power times one additional HIGHLY RELEVANT variable – the power factor. It can contain infinite values between 0 and 1, where 0 is maximum inefficiency and 1 is optimal efficiency. The bill you are charged for runs in real power values, so this is the one you should always consider. In Real-Life Scenarios. From this moment forward, AC circuits shouldn’t be that much harder to comprehend. We know that our appliances have three different power consumption readings. We also know, that the value which the power companies consider for billing purposes is the real power consumption. And, that real power can be calculated if we know the power factor. But wait, how can I know this value on my home appliances? Is there a chart somewhere? Does the manufacturer establish this value? Can I calculate it? The answer to all those questions is, probably yes. However, there is one easier method – and we’re all about simplicity. So when all else fails, we go back to basics – measurement. Fortunately, there are some tools at our disposal. Most modern multimeters have a variety of different parameters we can measure, and yes, power factor is one of them – all you need to do is set, plug, and read. All this information is pure gold, so why can’t we start sizing generators yet? Because AC circuits have one little secret more to unveil, and it has to do with power as well – this is the last one, promise. All these power definitions are relevant to a deeper understanding of electrical circuits. However, for sizing purposes, we’re going to use two values of real power, expressed in watts – running watts and surge watts. Take any working appliance at home and measure its power consumption with a multimeter – this value represents the running watts. The other value is known as surge watts, the power which an appliance demands when you turn it on – surge power is significantly harder to measure because the kickstart required to get a motor running lasts only a fraction of a second. Most manufacturers will provide this information as part of the technical specs somewhere in the manual, but it’s a good practice to use your multimeter anyway – either because older appliances sometimes don’t have these values on them or because they will differ considerably from the theoretical ones. Finally, to the practical exercise! Picture this: after a severe storm, a tree fell down and disconnected the power lines in your street. It’s a small rural town so there’s no provision as to when they will repair the damage – your fridge is full of food and you’re on a tight deadline to write some college papers. Luckily, though, you have a contingency plan because you have a portable generator sized for exactly this scenario. The first thing you did was determining the appliances you wanted to connect to the generator, and you chose the three things you couldn’t do without – the fridge, the microwave oven, and the desktop computer. The next thing you did was writing down the running and surge watts for these appliances, which you found in the user manuals you knew you kept for a reason. Here’s a summary: your fridge requires 700W of running power and 2,200W of surge power, your microwave oven runs on 800W but requires 1100W to start, and your desktop PC runs on 400W along a 600W requirement when you turn it on. What this means is that you need a portable generator capable of delivering at least 1,900W of running power and 3,400W of surge power. The running wattage demand is simple, just add all the values and that’s it – total running wattage=700W+800W+400W=1,900W. Calculating the total surge wattage demand is also a sum, with a trick. Since the surge power demand occurs only for a fraction of a second, you don’t need to add all the surge values together. Instead, the easiest way to do it is identifying the appliance with the largest surge wattage, replace the running wattage value with the surge one, and add the rest of the running values. Total surge wattage=2,200W+800W+400W=3,400W. With these numbers, you decided to buy a small gas generator with a capacity of 3,500-running-watts, 4,000-surge-watts, and a four-gallon gas tank. So, you decided to be the ant, not the grasshopper. When disaster struck you were prepared and with just a few bucks worth of gas, you bought yourself enough time for power to be reinstated to the main grid. Before we explore the many specs which these portable generators have to offer, let’s take a closer look at the common features available on most models we can find on the market. For that, we will ask a series of questions which all manufacturers, vendors, and sales representatives should be able to answer. How do I turn it on? Typically, portable generators have two types of starting systems, electric start and pull start. An electric start requires a battery – usually included in the generator price, but ask anyway – to power the device by pushing a button – fast and hassle-free. A pull start is similar in notion as using a chainsaw or a land mower. By pulling the cord, you generate enough mechanical energy to kickstart the engine. Some newer models have refined this method, making it much smoother to pull. However, some older generators still need quite a strong jump, which might be a little inconvenient. What type of fuel do generators burn? Are they in compliance with pollution levels? Gasoline is the preferred and most common option, but there are some models which also run on natural gas or propane – alternatively, you can install a conversion kit. All models that go out in the market are in compliance with the U.S. national regulations – except maybe in California. The Golden State has tougher standards when it comes to pollution levels, so not all models might be sold there. If you live in California, just ask your sales representative if the generator is CARB-compliant – the California Air Resources Board. How heavy can they get? Are they easy to move around? Some generators can weight more than 200 lbs. Most heavier models have wheels, so transportation is easy, even when moving the device by yourself. Do ask about it, though, because some manufacturers sell them separately. How do I know if it needs more fuel or an oil change? Most portables have an analog fuel gauge so you can see its level as it’s working. Same as all engines, you can check the oil level while on cool-down and replenish it or go for a full oil change. Additionally, some models have a low-oil shutdown mechanism which stops the engine if the oil level falls below a minimum to prevent any damage. Are generators safe to use? Are they too noisy? Manufacturers have countless standards and compliance guidelines set upon them, so these devices are generally safe to use. Some camping sites will require some additional features, such as spark arrestors (they prevent sparks and embers from coming out of the exhaust) or power inverters (not only are they gentler with high-end electronics, but they also run much more quietly). Portable generators range between 45dB (library ambient noise) to 75db (somewhere between standard traffic and a vacuum cleaner). Don’t be intimidated by the exhaustively long user manual, because there are only two ways to connect your generator and get it running – by using extension cords and by installing a transfer switch. Both have pros and cons, so we’ll lay everything on the table and let you decide which way to go. By the way, all those concepts we learned earlier will come in handy now – voltage, current, power, and AC circuits in general. Extension cords are, for lack of a better definition, electric cords that go from the generator directly to your home appliances. They are cheap, hassle-free, and can supply power to several devices at once -but with great facility comes great limitation. You might need more extension cords coming out of your appliances and into the generator cord. You can only power devices with electric plugs – no ceiling fans, no lights, and no embedded or hard-wired electronics. Extension cords represent a safety hazard all by themselves by posing risks of tripping and falling, faulty wiring, overheating, etc. Also, they’re not recommended if you have pets or small children in the house. If you decide to go with this option, make sure you buy a reliable generator cord compatible with your portable generator. These are the electric parameters that should match between your generator and the cord: voltage outlet (in volts), current rating (in amperes), and plug type. This setup is great for camping sites and small workshops. Transfer switches are more complicated in nature and often require a professional installation, but offer many advantages compared to the previous option. Instead of running extension cords everywhere, the transfer switch is connected next to your main circuit panel, so that you can plug your generator to it with one single cable — which allows several benefits. Now you can supply power to entire circuits, rather than just singular appliances — say hello to lights, ceiling fans, and all hard-wired components. Once the installation is complete, running the generator is even easier than with cords – just plug it into the transfer outlet, flip some switches, and pronto. This setup greatly reduces all safety hazards and has a longer lifespan as well. However, installation can get really expensive – close to $1,000. Supplying power to entire circuits is tricky because there’s no in-between – you can’t select which devices in the circuit will get the power, but you can unplug them if they have electric outlets. Additionally, some smaller generators won’t support this kind of setup, so you’ll have to do with extension cords. Great! I sized, I bought, I conquered. But now that everything is settled you need to know all the steps for when disaster strikes – panicking is not an option, though. First of all, remember that a generator is basically an engine, and we never place an engine indoors. Inhaling smoke from the exhaust for extended periods of time can cause serious respiratory damage and even death – so we recommend placing it at least 25 feet away and closing all windows and air entries in the house. Before turning the generator on, make sure it’s disconnected from EVERYTHING and also turn the circuit breaker off – if you’re using a transfer switch, turn the circuits off as well. Fill up the fuel tank, check the oil level, and open the fuel valve. Now you can turn the generator on, pull the cord or push the button and let it run for a few minutes until the meters read steady values of voltage and current. If you’re using an extension cord, plug in your appliances one by one. If you’re using a transfer switch, plug the generator in, flip the switch, and one by one turn the fuses on. In the very first run, you’ll need to stop the generator after four or five hours to change the oil, on all other runs just do it according to the manual. NEVER refuel the tank while the generator is running or you can get seriously burned and possibly damage some components, too. To avoid any overloads, always connect the appliance with the highest surge wattage first. To turn the generator off for refueling or when it’s no longer needed, follow the same steps inversely. After you’ve disconnected all appliances/turned all circuits off, unplug the generator. Set the generator to the slowest speed for a smooth transition. Turn the engine off, close the fuel valve, and store. Affordable and reliable. What more do you want? EPAIII and CARB compliant generator allows for operation in all 50 states. 1800 surge watts and 1500 running watts provides power for both times of emergency and recreation. Lightweight and compact generator runs at half load for 7.5 hours off of 1.45 gallons of gasoline. Includes two AC120V 12.5A three-prong wall outlets and one cigarette-lighter-style 12V DC outlet. Includes two AC 120-Volt 3-prong wall outlets (standard household 5-20R) and one cigarette-lighter-style 12-Volt DC outlet. Spark arrestor allows you to safely use your generator in all national parks and forests. View or download the MANUAL for the WEN 56180. With 1,500W of running power and 1,800W or surge power, this generator can support your fridge, HDTV, computer, and possibly even your microwave oven all at the same time – just make sure you size your demand first. It has a 98cc, four-stroke, single cylinder, air-cooled, CARB-compliant engine along with a fuel tank of 1.45 gallons and an oil reservoir of 13.5 ounces. This allows for up to 7.5 hours of running time on a full tank, at a 50% load. Light-weighted and compact, weighing only 51 lbs. and measuring 19.9 in. long/15.9in. wide/17.1 in. high, this generator is also very quiet — only 63db at 22 feet of distance. The WEN 56180 has a pull starting system and no wheels, but it provides some added value. A low-oil shutdown mechanism along with the circuits breakers will protect the device from unnecessary damage due to lack of oil and power overloads. Additionally, the panel comes with two 5-20R, 120V AC, standard household outlets and one 12V DC cigarette lighter outlet for recharging all kinds of batteries. But wait! There’s more. Its spark arrestors make it compliant with all national parks and forests, so it’s the perfect companion for your next family camping trip. 1-year limited warranty; CARB and EPA compliant. Weighing less than 36 pounds, equipped with a carrying handle and stabilized with 4 rubber pads, this generator is built for portability. Uses oil/gas mix fuel so there’s no need for oil changes; The one gallon tank can run for 5 hours at half load. Quiet exhaust system with spark arrestor is 60dB at 22 feet and is certified for use in any national park or forest. 1000-Watts starting power and 900-Watts running power. The PowerPro 56101 offers 900 running watts and 1,000 surge watts. But don’t be fooled by its size. It has a 63cc, 2hp, CARB-compliant engine. The fuel tank capacity is one gallon and you can expect to run it for five hours on a full tank, at roughly 50% load – there is no fuel meter in this model, so you’ll have to keep the running hours in mind. This generator has a two-stroke engine which means it has no oil reservoir, so you have to mix it with the gasoline on a recommended ratio of 50:1 – 2.5 oz. for every gallon. Nice and compact. Very easy to carry anywhere. Only 35.5 lbs. This model defines portability weighing only 36 lbs. with dimensions of 14 in. wide/12 in. deep/13.5 in. high – no wheels on this model, though. It’s relatively quiet, showing readings of 60db at 22 feet of distance – same as a normal conversation. The small generator includes a voltmeter, a 12V DC outlet, and a DC cord with clips. It runs on a plastic pull start, so we recommend replacing the factory’s pull mechanism with a stronger one from the hardware store. Since the engine is a two-stroke one, there’s no need for oil changes, and because it’s so small it overheats a little faster than other models. Cheap, compact, and easy to use. The PowerPro 56101 packs quite a punch at a low investment, ideal for backing your refrigerator up, microwaving dinner, or watching TV – just not at the same time. Never use your gas generator indoors. Please read the manual. View or download the MANUAL for the Sportsman GEN2000. The Sportsman GEN2000 offers 2,000 surge watts and 1,400 running watts with its 2.6hp, four-stroke, EPA-compliant, overhead valve engine. It features an oil storage of 12 ounces and a fuel tank of 1.2 gallons which offers a total running time of nine hours at a 50% load. 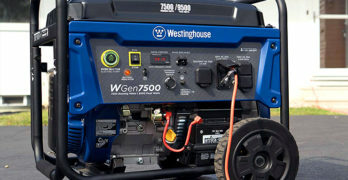 This generator has a pull starting system, no wheels, one 12V DC outlet, two 5-20R, 120V AC, household outlets, and runs on gasoline – just as the other models. Weighing only 53 lbs, this generator is also compact, measuring 18.5 in./14.75 in./16 in. in total. From the same standard distance of 22 feet, it emits only 65db – a bit louder than a conversation yet quieter than standard traffic. Since this model is more powerful than others, it’s ideal for backing power up on most households, small shops, workshops, and outdoor sites as well – just remember to a basic sizing before you plug your devices into the generator to avoid overloads. Well-made: Great for camping, job sites and emergencies. 1200 running watts/1500 starting watts. 65 dBA at 23 ft.
.75 durable tubular steel frame. Includes: Spark arrestor kit, Vibration mounts, Oil funnel, Spark plug socket. Another slightly similar model comes in the form of the Champion Power Equipment 42436. With a surge wattage of 1,500W and a running wattage of 1,200W, this model comes with an overhead valve, 80cc, CARB-compliant engine. At a 50% load, this generator can run up to ten hours on a full fuel tank of 1.45 gallons. Its oil storage has 15.4 fluid ounces. This generator is unique because it features two key technologies. Volt Guard is an embedded surge protector which will protect your appliances from any power spikes above their safe threshold. Cold Start is designed to start the engine even on the coldest environments. The CPE 42436 has a pull-start mechanism, no wheels, weights 62 lbs, and measures 17.7 x 14.0 x 14.8 inches. It comes with one 5-20R, 120V AC, household outlet and a voltmeter. From a distance of 22 feet, you will notice it just slightly louder than a normal conversation, reading 65db. This compact powerhouse is perfect for camping, tailgating, weekend trips, workshop jobs, hunting, fishing, etc. Includes wheel kit with front handle making it easy to move around. Now to the big guns. The DuroStar DS4400 delivers up to 4,400 surge watts and 3,500 running watts. It has a 208cc, 7hp, overhead valve, air-cooled, CARB-compliant engine equipped with an automatic voltage regulation system. This generator can easily support a sump pump, a refrigerator, a small AC/heater unit, along with several smaller appliances such as radios, battery chargers, and lighting bulbs. With a fuel tank of 4 gallons, you can expect to have a running time of eight hours at half load. Since this model is more robust, you can also connect it to your panel by using a transfer switch. The DS4400 has a pulling start system, weighs 130 lbs., measures 25 x 23 x 22 inches in total, and YES! It has wheels. The panel includes two 5-20R, 20A, 120V AC household outlets and one 30A, 120V/240V, twist lock outlet. You’d think that this beast would be much louder, right? But from a distance of 22 feet, it reads only 69db – similar to non-rush-hour traffic. Some added goodies include a low-oil shutdown mechanism and a spark arrestor — in total compliance with all forests and national parks. Additionally, this generator is one of a few which could power your entire RV. Powered by the Briggs and Stratton Brand 550 Series OHV 127cc Engine. Briggs & Stratton Brand 550 Series OHV 127 cc Engine. Power Surge Alternator to run multiple large appliances at the same time. Includes a low oil shutdown and fuel gauge. 2000 running Watts / 1700 starting Watts. Rated in accordance with CSA and rated in accordance with PGMA standards. 1700-Watt Gas Powered Portable Generator. Supported by the Briggs & Stratton Nationwide Service Network. (2) 120 volts-20 amp Outlets / (4) 120 volts-20 amp Outlets. Run multiple large appliances or power tools at the same time. Engine produces 5.5-foot-pounds of torque. 2-gallon metal fuel tank provides 8-hours of continuous operation at 50-percent load. Fuel gauge for monitors gas levels. Never go flat wheels make transportation easy. The PowerBoss 30542 offers 1,700 running watts and 2,000 surge watts. However, thanks to its unique Power Surge Alternator you can expect to have an additional 25% of surge power for starting more appliances at once. This generator has a pulling start system and is equipped with a 127cc, overhead valve engine this model has a two-gallon fuel tank with a fuel meter gauge, delivering up to eight hours of running time at half load capacity. Although not included in the standard model, this generator can be equipped with wheels. It weighs 80 lbs with sizes of 17.3 x 20.6 x 15.3 inches. It’s also tolerably quiet, ranging from 65dB-70dB from a 22-feet distance – not louder than normal traffic or a land mower. The panel includes two 5-20R, 20A, 120V AC, household outlets. The engine features a circuit breaker to protect it against overloads and is also equipped with a spark arrestor, perfect for any campsite, forest, or national park.